As they turned a corner the flames chased them as though they were alive, sentient, intent upon killing them. Now the fire was mutating, forming a gigantic pack of fiery beasts: Flaming serpents, chimaeras, and dragons rose and fell and rose again, and the detritus of centuries on which they were feeding was thrown up into the air into their fanged mouths, tossed high on clawed feet, before being consumed by the inferno. There's so much isolation in book seven as they search for Horcruxes, and so then it's almost as jarring for you as for them when it's just suddenly BOOM they're at Hogwarts, and from Hogwarts it just goes and goes and goes and you can't stop because OMG SO MUCH IS HAPPENING and people are dying and you don't have time to mourn them because HORCRUXES and then Snape's history with Lily which good LORD how does she manage to make their relationship in 20 pages a hundred times more meaningful and believable than Ron and Hermione's when they had SEVEN BOOKS? Referring to Harry and Voldemort and Snape as "the abandoned boys" got me this time in a way it didn't the first time through. Those three and how they all responded differently to their abandonment. Voldemort's complete lack of love, Snape's redemption through knowing Lily, and Harry's improbable normalcy, brought about let's just say for defense of the book's sake through Lily's sacrificial love for him. The abandoned boys are the center of the series, and Lily Potter is the center of them. The thing that stuck out the most to me the first time I read it, and which I read with scarcely any less delight the second time through, was the Malfoy family. Look, I started this series when I was 14, and my brain was as soft as very stupid cheese, so I hated whomever Rowling seemed to want me to hate. The Malfoys seemed terrible, so they were terrible. But then when Narcissa leaned in and asked the apparently-dead Harry IN FRONT OF VOLDEMORT AND ALL HIS FOLLOWERS if Draco was still alive, that did it. 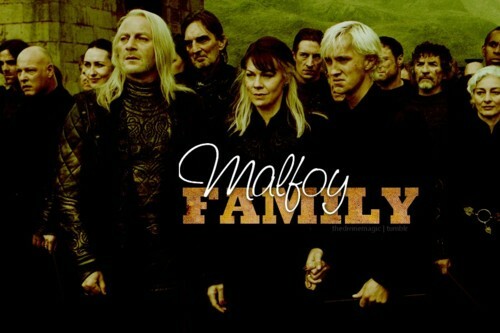 The Malfoys became one of my favorite parts of the entire series. ...and Lucius and Narcissa Malfoy running through the crowd, not even attempting to fight, screaming for their son. Rowling just continually amazes me with how she can present you with one side of a character, make you HATE them, and then by giving you one other trait, completely flip it. She's good — she's SO good — at seeing the redeeming bit of humanity in everyone. Our readalong-as-a-whole wrap-up post is next week, so I won't comment on the entire series. But barring the epilogue — which I decided to ignore this time around, as it's not canon, I'm sorry — this is all I could've asked for from JKR. She did such a good job. Can you believe we have something like this in our generation? Damn, you guys. Thanks for doing this.